Next Kraftwerke’s central control system has integrated the innovative Power-to-Gas unit in its Virtual Power Plant “Next Pool” and controls the electrolyzer in case of an excess of solar and wind power in the distribution network area. The electrolyzer, operated by Greenpeace Energy and the public utility in Bavarian Haßfurt, has a capacity of 1.25 MW and is able to produce hydrogen from excessive power generated by renewable energies. The asset will also provide control reserve to TSO Tennet. “It took Next Kraftwerke only ten weeks to integrate the electrolyzer into the Virtual Power Plant. This proves that our control system can handle a variety of different technical assets and successfully and quickly make them a part of our Virtual Plant.” said Jochen Schwill, CEO and founder of Next Kraftwerke GmbH in Germany. The asset is running according to the local network load in the distribution area of the public utlity Haßfurt. For this pupose, Next Kraftwerke does the forecasting for the feed-in of renewables in the region as well as the forecasting of energy consumption in all of the distribution area. 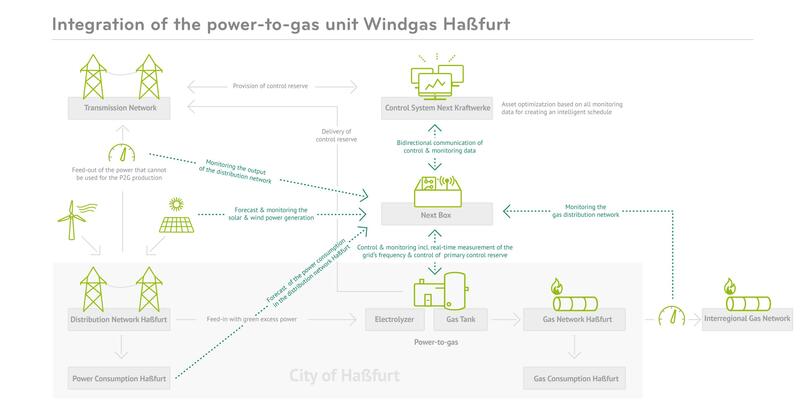 Additionally, Next Kraftwerke’s central control system takes into account the flow rate of the local natural gas network. The latter takes in the hydrogen produced in the electrolyzer. Based on this data, the central control system calculates when to run the electrolyzer and operates it automatically via the remote control unit Next Box. As a result, the Power-to-Gas asset only runs when there is an excess of renewable energy and, in doing so, relieves the local as well as the distribution network. Thanks to the responsiveness of the Power-to-Gas technology, the electrolyzer is perfectly suitable to provide control reserve to stabilize the grid. The asset is able to follow Next Kraftwerke’s signals within milliseconds and can ramp up to a load of 1.25 MW within 20 seconds. This is why the asset is able to provide for all three kinds of control reserve: Primary Control Reserve, Secondary Control Reserve and Tertiary Control Reserve. The unit has already gone through the necessary in-house tests and has now entered the prequalification phase with TSO TenneT. In the future, the Power-to-Gas unit will, thus, not only relieve the distribution network, but also contribute to stabilizing the transmission network.